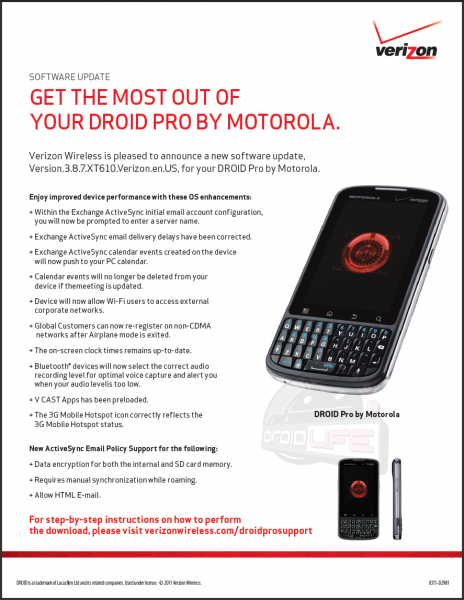 DROID Pro Update to Version 3.8.7 is Live! The DROID Pro update that we uncovered last week which brings the device up to Blur version 3.8.7 along with a bunch of ActiveSync fixes and the VCAST appstore, is rolling out now. Actually, it may have started rolling out yesterday, but the big push is happening today. Rumor: Motorola Prepares the Jet and Bullet as its First Tegra 3 Devices, Headed for Q1 2012?